This was an amazing week weather wise having daytime temperatures in the 70’s, just a few 10 minute showers at suppertime to give us some beautiful rainbows plus the nights were in the low 50”s. 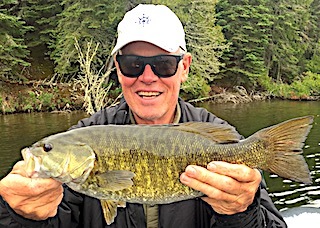 As for the fishing it was a Smallmouth Fishing Mania as you will read about below. Carl Quetermus with Ton & Majorie Chambers from Villa Rica, GA, returned for their 3rd time together in 4 years to Chase BIG Northern Pike and Smallmouth Bass. First day they caught some Pike but they were not jumping in the boat. 2nd day was surface fishing for Smallmouth Bass, catching 22 nice fish along with a dozen Northern Pike. 3rd day they had 28 Northern Pike, which is a very good day, but they had more fish follow than were caught. 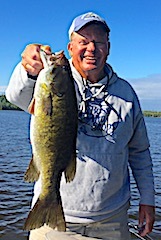 4th day they had a fabulous day Smallmouth Bass fishing catching 62, with Carl having two trophy fish over 18-inches & Tony landed one Trophy. 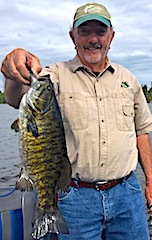 5th day the Pike fishing was a little off catching some up to 32-inches, so the returned to Smallmouth Fishing catching 44 with a lot 17- 17.75-inches & had to resupply their sinking worms at the tackle shop for the third time. 6th day the Pike were still not agreeable so they turned to Smallmouth again. 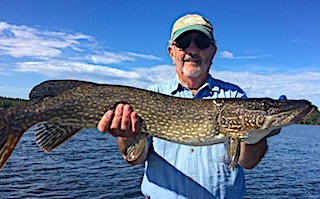 7th day the Northern Pike turned on catching 47 total up to 36-inches. The 8th day Alvin Ginn from Franklin, GA, a friend of Carl’s showed up to fish with him for a day. 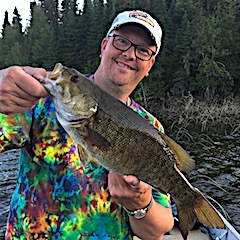 This was his 1st time ever fishing for Smallmouth Bass but Alvin on his very first cast caught a 17.5-inch Smallmouth Bass plus him & Carl ended up catching 82 Smallmouth Bass before supper. 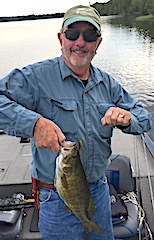 Alvin landed two Master Anglers Award Smallmouth measuring 18 & 18.5-inches. Needless to say Alvin was hooked on Smallmouth fishing by the days end. All left having had a terrific stay and hope to return in 2018. 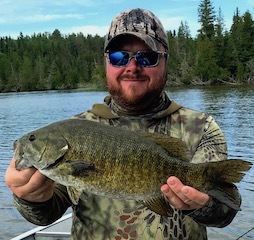 Jerry, Denni Jo, and Ben Lester from Waconia & Plymouth, MN returned for their 5th trip with us at Fireside Lodge, mainly to chase the BIG fighting Smallmouth Bass we have. 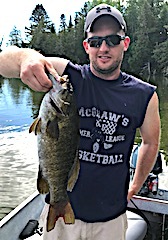 DOA day before supper Ben set the pace fishing with a Gold Mepps #3 with a white skirt catching a Trophy Smallmouth Bass & the most fish. 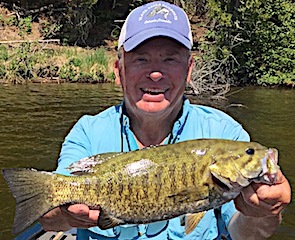 After the end of the 1st day they caught 34 Smallmouth with Ben landing two trophy fish at 18 & 18.5-inches but Jerry got the largest Trophy measuring 19-inches. 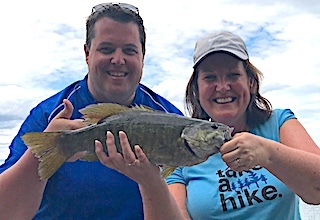 2nd day was great as they caught near 46 Smallmouth Bass before suppertime, Ben catching a lot of 17 to 18-inch fish plus DJ caught her first trophy an 18-inch Smallmouth Bass & also caught another after supper. Also DJ just missed a 3rd measuring in at 17.75-inches. Today the magic was a surface lure, the Torpedo & the Ned Rig. Ben also spotted a HUGE Muskie which Jerry brought up to the boat 3 times, following his Torpedo but would not take his lure. Being from Minnesota living on a lake with Muskie so they have seen their fair share of Muskie and said this one was upper 40 to the 50-inch plus range. 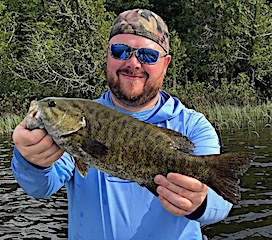 3rd and final day was their best catching 66 big Smallmouth Bass 15 to 18-inches plus they lost at least 35 fish as they were fishing surface lures all day long. DJ had a special catch landing 2 bass on the same lure on one cast, hooking each on a different hook. They all had blast making family memories and when checking out Jerry stated that they will be back. Bruce Pearson from Wayzata, MN was here with his son Tobin for a special 13-year old birthday fishing trip. This was the trip Tobin selected over several other possible choices. 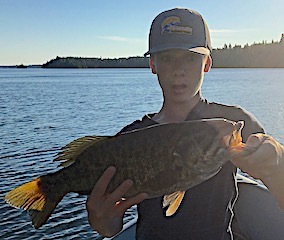 DOA right out the gate they caught fish before supper then before fishing that evening Tobin, after some careful consideration picked out a Yo-Zuri shallow suspend twitch bait lure in hopes of catching a Big Smallmouth Bass. 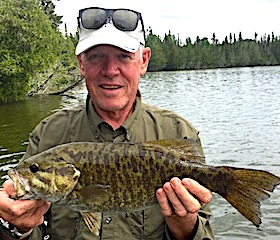 After fishing that evening they came in the lodge looking for Audrey & I full of excitement to tell us their fishing story plus show us a picture of a Trophy Smallmouth Bass Tobin caught on the Lure he selected from my tackle shop. First day had the wind giving them some problems but they caught some nice fish and learned some of the lake. 2nd day was a discovery day having fun searching for Northern Pike getting some follows but it seems as if the fish were just not interested. The 3rd day was a completely different story as the Pike turned on catching 20-25 fish, not counting the ones that got off, which they said were almost as many as they caught. 3 days of fishing goes by fast but both left having a memorable father and son fishing trip-making memories together that will last their lifetime. Zack Sheares and Nathan Montgomery from Cincinnati and Columbus, OH were very excited to be at Fireside Lodge for their first time. 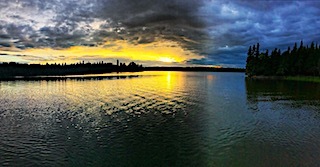 DOA before supper they caught a dozen nice Smallmouth Bass, both landing a Master Anglers Award Trophy at 18-inches+. 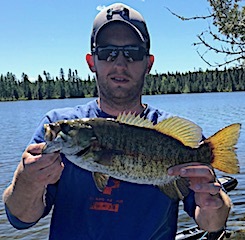 Great start for new fishers to Little Vermilion Lake. 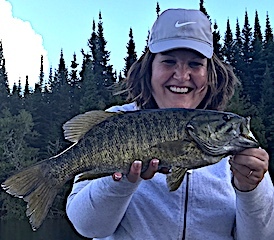 1st full day on the water ever fishing Little Vermilion Lake these two did fantastic catching 44 Smallmouth Bass each catching 3 Trophy size fish 18 to 19-inches. 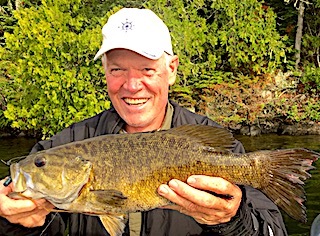 2nd day was TERRIFIC catching 52 Smallmouth Bass before supper almost all being Big fish with 5 More Master Anglers Award Trophies between 18-19-inches, the top Smallie being a 19.25-incher. 3rd day was a day Nathan said Fireside Lodge ruined fishing for the rest of his life because it will be hard for him ever to fish at home again. 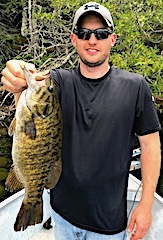 They caught 117 Smallmouth Bass, the majority being over 16-inches, many 17-17.5-inch fish plus 18 Trophy Smallmouth Bass over 18-icnhes, 5 of those being 19-inches or better. 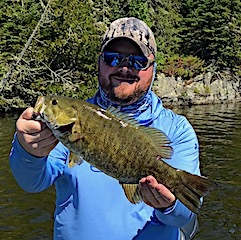 Zack stated that he has been keeping fish records of his bass catches for a long time and this was his best day ever catch 63 Smallmouth Bass toping his now second best of 38. 4th and final day was another great day fishing catching 43 Smallmouth Bass, 3 Northern Pike, and Zack caught his first ever Muskie. 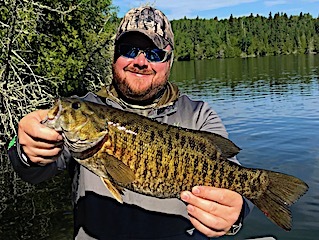 The best catch of the day went to Zack as he caught the Smallmouth of his life landing a GIANT beautifully barred 20.5-inch Trophy Smallmouth Bass. 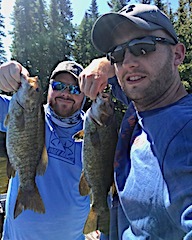 Total Master Anglers Awards Trophy Smallmouth Bass for these two were 37 and the breakdown was, 20 at 18-inches, 2 at 18.25, 2 at 18.5, 1 at 18.75, 6 at 19-inches, 3 at 19.25, 2 at 19.5, and 1 at 20.5-inches. Both went home having the best fishing trip of their lives saying that they will have a difficult time wanting to fish anywhere else.